The popular television game show Let's Make A Deal continues throughout the world -- forty-eight years after its debut on the NBC Television Network on December 30, 1963! Broadcasters in Europe and Asia have produced their own versions of Let's Make A Deal - to the delight of their contestants and viewers. And now CBS network has an all-new version of Let's Make A Deal! JUNE, 2009 - GSN HONORS MONTY HALL -- THE GAME SHOW AWARDS: On June 6, an awards show aimed at celebrating excellence in the genre of games honored classic and contemporary game shows, with a special tribute to Monty Hall and a guest appearance by Carol Merrill. 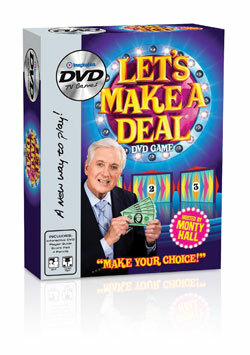 You can play the LET'S MAKE A DEAL at home - for fun and a large dose of nostalgia - with the Let's Make A Deal DVD Game featuring Monty Hall and clips of Let's Make A Deal shows broadcast in the 1970's and 1980's . From IMAGINATION - a new way to play Let's Make A Deal! Stay alert and you'll catch a glimpse of vintage Let's Make a Deal playing in the background of movies set in the 1960's and 1970's. Some of the films which were enlivened by a clip of Let's Make a Deal are listed on our Movies page. 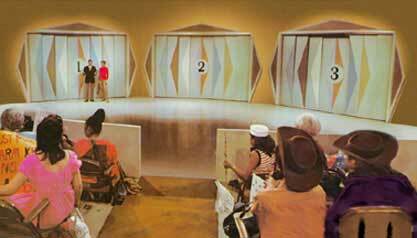 For information about recent appearances by Monty Hall click on the News link - and for the latest theories about "The Monty Hall Problem" - click on the Trivia link. Let's Make A Deal is a creation of Stefan Hatos and Monty Hall. Carol Merrill and Jay Stewart performed on the show through 1977. The television production has been broadcast by NBC and ABC television networks, as well as many channels throughout the country on a syndication basis. Re-runs of the original telecasts have been shown on various cable channels. Since 2001 the Game Show Network has broadcast classic episodes of Let's Make A Deal from the 1970's and 1980's. 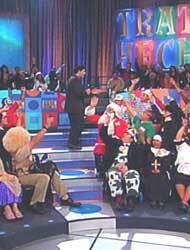 And Trato Hecho (a Spanish-language version of Let's Make A Deal) was broadcast in 2005 on Univision stations throughout the U.S. Since the early 1990's FremantleMedia has licensed foreign language versions of Let's Make A Deal in countries throughout the world, including France, Germany, Greece, Hungary, India, Indonesia, Israel, Italy, Lebanon, Mexico, Poland, Portugal, Romania, Spain and Turkey. In 2006 - Let's Make A Deal was part of the Game Show Marathon in which recreations of vintage game shows were broadcast in primetime on the CBS network. In March 2003 NBC aired a U.S. revival in primetime which was hosted by Billy Bush and produced by Monty Hall Enterprises and Renegade 83. Home Games of the show have been marketed since the early 1960's by Milton Bradley and Ideal Toys. In 1998, Tiger Electronics introduced an "Electronic Let's Make A Deal" ... a modest precursor to today's DVD game by Imagination. In 1999, BuyBidWin.com licensed the internet rights from Let's Make A Deal and launched a website featuring Monty Hall. Live productions of the show have appeared throughout the U.S. with host Tim Wise of "Let's Make a Deal on the Road" - for the latest developments, visit Tim's website at www.letsmakeadeallive.com.